Other than the Nuremberg and Socrates trial games, there are no other famous trial games. There isn't one about Louis XVI or Charles I, for example. 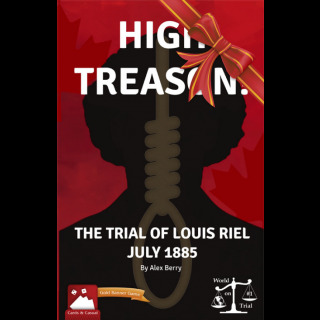 So the pick of the trial that sent Louis Riel to the hang man seems an odd choice. That is, if you are looking at it from non-Canadian eyes. For the Metis (mixed Native American and French-Catholic ancestry in Canada) and other western Canadians, the name Louis Riel is probably pretty well known. He was, and continues to be, a polarizing figure in Canadian history. The stranger fact about Mr. Riel is that his very sanity was, and is in the game, a very large part of the trial and his legacy. To give you some background information, Louis Riel was one of the founders of Manitoba and a politician in 1869 who was a leading person in a small rebellion of the Metis against the mostly English ancestry central Canadian government. It was effective enough to force the government to agree to a compromise about land rights, called the 'Manitoba Act'. Mr. Riel then fled Canada and lived in the U.S. for about fifteen years until a new powder keg of Metis grievances exploded in Saskatchewan. He came back to Canada to fight against the government forces, but this was not 1869. The railroads enabled the government to bring large numbers of actual troops and Mounties to crush this rebellion. During the years in the U.S., there was some question about his sanity, and how much of a grip he actually had on reality, along with some religious mania. I am just condensing his much greater history and that of the western expansion of the Canadian government to give the reader some background. 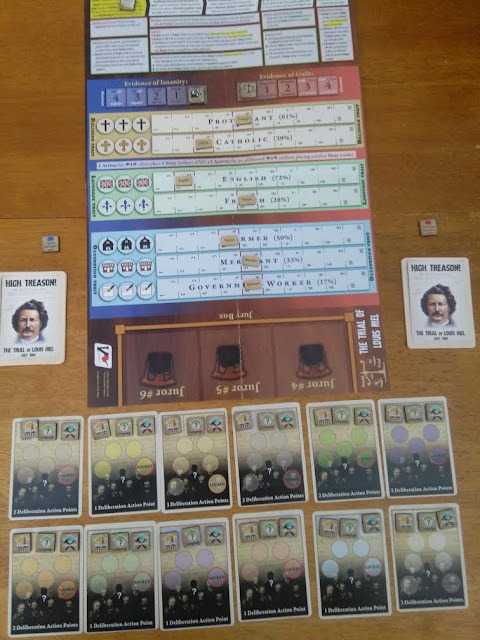 Before the board game, I had no idea whatsoever about the man and his cause, and it opened up a whole new historical vista for me to explore. So enough about that; how is the game? Victory Point Games, who call themselves 'The Little Game company That Could' is the producer of this game. Wargamers might be more aware of their Napoleonic '20' series games. The box is small, but the components are well done, with one caveat. I did have two counters that had one side of their printed face start to come off at a corner. This might have been my fault, as I did not use a razor knife to take them out. The first few came out so easily and with really no cardboard excess that I didn't think I needed to use one. Victory Point Games even includes a small napkin to deal with any left over charcoal on the counters. You can either play historically or you can add 5 'What If' variant cards to the deck. 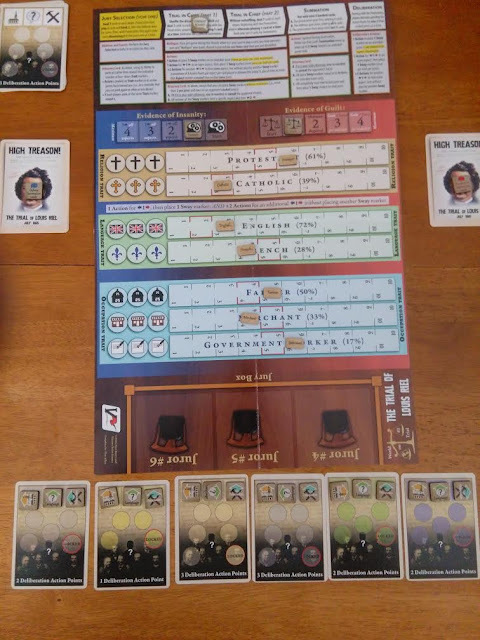 As with most games, when you set them up you will put the 'current round' marker on the game mat to show what round of play you are on. Then you take the 'evidence of guilt' and 'evidence of insanity' markers and put them on the '0' space on their tracks. Jury selection is a very important part of the game, but it is not as cut and dried as most of us think. I will use two quotes from the designer to illustrate this. He is also a practicing attorney, so he should know. "The goal of jury selection is not discovering whom you want to keep on the jury, but whom you wish to excuse from it". "Remember your goal in jury selection is to sneak onto the jury those who, after the Trial in Chief cards are played, should be the most inclined to support your cause (Prosecution: English, Merchant, Government Worker, and Protestant; Defense: French, Farmer, and Catholic). Don't let the starting values of the various aspects fool you during Jury Selection! It is where they end the trail that matters, and there will be a lot of of cards played between Jury Selection and Deliberation. Examine the deck, look at your Trial in Chief Events on them, and play to your cards' Event strengths!" Each of the first three rounds both sides are dealt seven cards. You are able to use five and keep two for the last round. So you will be using a total of fifteen cards during the first three rounds, and saving six for the summation round. You start with twelve jurors and both defense and prosecution use their five cards to find out as much as they can about the jurors. Are they French Canadian farmers or English government workers? Then both sides pare down the jurors until there are only six left. The cards are a mini-history lesson by themselves. At anytime during the first three rounds you can ask for a 'Mulligan'. The only downside of this is you get one less card than you would normally. So if you kept two cards and asked for five, you would only get four and so on. You are able, by use of the cards, to lock both jurors and the religion, ethnicity, and their avocations' aspect tracks. Locking the jurors to your side is a very strong way of play. In the deliberations part of the game, a locked juror can sway others that he has something in common with. This can produce a snowball effect on the jury. If, at the beginning of the deliberation phase, the evidence of guilt marker is not at least in the number box two or higher, the prosecution has not proven its case and the defense wins. If the evidence of guilt marker is in the number two box or higher you continue with the deliberation phase. The evidence of insanity marker helps to sway the jury to the defense. If it is at a zero or a one, nothing happens; for each number over one you move the aspects marker toward the defense. After the deliberation phase, it is a simple process of adding up the guilt value of each juror. The aspect tracks influence the guilt value in a plus or minus way. If the guilt value is a combined score of 99 or lower the defense wins. If the score is 100 or above the prosecution wins. Once both parties have the rules and sequence order down pat, the game really only takes between thirty minutes to an hour. Where it really shines is the ability for replay. One would think that a historical trial would become rather stale after a few play-throughs. In reality, all of the different cards and the strategies that a player can use keeps it fresh. The use of 'What If' variant cards also helps to keep the game from getting stale. The game, while being both small and short, means that the gamer doesn't have to take up much space with it or leave it up for any long period of time. For a two player game that is going right now for $20.79, you cannot go wrong. In the 'Publisher's Note', Alan Emrich writes that he would like to see games made of other famous trials, with a list of them. I concur wholeheartedly with his ideas and most of his trial suggestions.